Harry Langhorne Houchins was born May 11, 1887 according to his death certificate. However, according to his U.S. World War I Draft Registration Card, he was born January 20 , 1887. It always amazes me how the official documents in our lives can disagree! We know that he died 26 Feb. 1973 because several people I know attended the funeral. Harry was my maternal Great Uncle and I remember him well. From the time I was five, I remember his coming to visit every so often. He would sit on the front porch, play his banjo and sing, and I would sit at his feet and say “again, again, again!” I adored him! Uncle Harry was blind. For a long time, he was the only blind person I knew. He used a cane and got along very well! I now know that Harry came down from the mountains of Virginia, to Richmond where we lived, to join his cousin John Watts Spangler, called “Babe” on his regular radio show on radio station WRVA . Harry wasn’t one of the regular band members who played on the show, but he was a regular substitute, a tribute to his talent. The regulars included John Watts Spangler known as Babe, and the Old Virginia Fiddler, Dudley Spangler, also called Babe, Charles Langhorne Spangler called “Tump” and Dave Pearson. J.W. Babe and Tump were brothers, Dudley and Harry were their first cousins! Music ran in the blood of this family! Dudley married Tump and J.W.’s sister, read their blog posts on the links above along with the others. They were characters and yet quite accomplished–all of them. Harry never looked like the young man on the cover of this album when I knew him, He looked more like the man playing the banjo on the video with Jason Harris. He had white hair, a white beard, and was about that same size. Yes, he often wore a cap like that too! That could be my great Uncle Harry, but it is not. Watching this man play the banjo makes my heart ache for my Uncle Harry, who has been gone for over 40 years now. He was quite a presence. Harry was the son of Walter Thomas Houchins and Evelyn Langhorne, both of whom I have written about in the past. His sister was my grandmother Kate, Katherine Steptoe Houchins Kerse. His mother died in childbirth when Harry was just 13, he’d be blind by 16–what a life. Two of the most significant people in his life, maybe more, were blind from a disease that is still evident in some of our family, retinosis pigmentosa. It causes people to go blind often at a very young age. Harry’s mother was going blind when she died at age 34, her father James Steptoe Langhorne, and her sister Fannie Langhorne Spangler (mother of Babe and Tump) were blind also! James Steptoe Langhorne, like Harry, went blind in his teens. Right after their mother’s death, the six living Houchins children were scattered out among different family members or friends. Evelyn died in 1900, her father in 1905. The kids’ father abandoned them, moving out-of-state, remarrying, and having another child by 1902, and a second by 1905. On the 1910 census, Harry can be seen living with his neighbor and lifelong friend, Joseph Hall. By 1920 he is living in Rockingham, North Carolina with his father, his stepmother who is his same exact age, Dad is 65, Stepmom Lena is 32, Harry is 32, Lena’s daughters are Pearl–17 and Lucille–15 years old. By the 1930 census he is still with his then 75-year-old Dad,and his 42-year-old stepmom. Pearl has left the home, but Lucille apparently got married at 15, like her Mom and her husband and 9-year-old daughter are living with them. By the 1940 census, the children have left the home, and Dad Houchins died in 1937. Harry and his stepmother Lena Elliott Houchins are both 53. I wasn’t yet born, and they had lived a lifetime! So, when I was six years old in 1955, Uncle Harry was 68 years old. He lived until he was 86 years old! I remember visiting him several times, and once meeting Lena. My mother told us Lena was his housekeeper! She never mentioned that she was his stepmother. I never knew she had children with my grandfather Walter Thomas Houchins until I did the genealogical research! More family secrets. But I suspect the real secret is that they never actually got married. I have never been able to find a marriage certificate for Walter Thomas and Lena Elliott. But they lived together 37 years, so they certainly had a common law marriage! While playing the banjo was Harry’s fondest past time, he also was trained by the Commission of the Blind to weave rugs, and to read braille. He enjoyed both of those things. He listened to a lot of books on tape later in life. 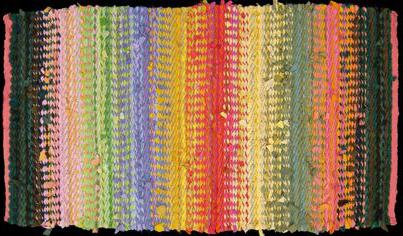 Our home, and those of our Aunts, Uncles, and cousins were filled with scatter rugs, very colorful, woven by Uncle Harry! In her book, Both of Me, by Harry’s niece Mary Stuart (Mary Stuart Houchins,actress and daughter of Harry’s brother Guy), wrote that when she was ten or eleven, in the late 30’s, Uncle Harry came to see her family in Tulsa, Oklahoma, and lived with them for a year! She says he jumped aboard a moving freight car with his banjo and a farm boy friend of his and traveled from Virginia to Oklahoma! Can you imagine, being blind, yet brave and or stupid enough to jump aboard a moving freight car! We certainly know he was a risk taker! I remember my Great Uncle Harry fondly, and I can’t hear a banjo today without thinking of him! Sweet memories, joined by research, make the best stories. Categories: 52 ancestors' stories in 52 weeks, Genealogy, Houchins family posts, Langhorne Family posts, Spangler Family posts | Tags: 52 Ancestors in 52 Weeks, Genealogy | Permalink. I find myself doing the same thing Cathy! LOL i’ll read someone’s post, and find myself researching their ancestors! It can be helful! I know i have his 1900 census on his page in my family tree, i’ll have to look at it again! Sometimes i too have to remember not to be so obsessive! LOL Thanks for sharing this journey! Still loving your family stories, Helen! Thank you Jeanne Bryan Insalaco! I appreciate your sharing this journey with me. Thanks my precious friend Linda McLaughlin, for reading and sharing. You love family so much yourself, your comment resonates! Just have to say how much I enjoyed getting to know Great Uncle Harry!!! Thank you so much Nancy Hurley, and I am looking forward to getting to know you as we share more! I can fill in the blanks about Lucille and her husband living back home with their daughter around 1930. They had a son Ray, who died at three years old from influenza in Stuart, Va., and Granny Long (Lucille) “went to bed” – wasn’t eating, wouldn’t speak, just stared straight ahead – so her husband brought her and their daughter to her mother’s and went back to Stuart to work until there was an opening in the mill where his brother worked.